Entry gate at The Black Sheep Asylum, Middlesex, North Carolina. Photo: Kay Whatley. The Black Sheep Asylum in Middlesex, North Carolina takes in animals with nowhere to go. The nonprofit provides services to humans through animal therapy. The asylum provides a safe place for animals and humans. Now, the nonprofit is holding a fundraiser that offers a fun night out and asks donors to help raise funds for feed, vet care, and other costs. The Black Sheep Asylum is a nonprofit Assisted-Animal therapy facility and livestock rescue in Nash County North Carolina. Schedule a visit with us and come out to the middle of nowhere to experience the peace and calm for yourself. 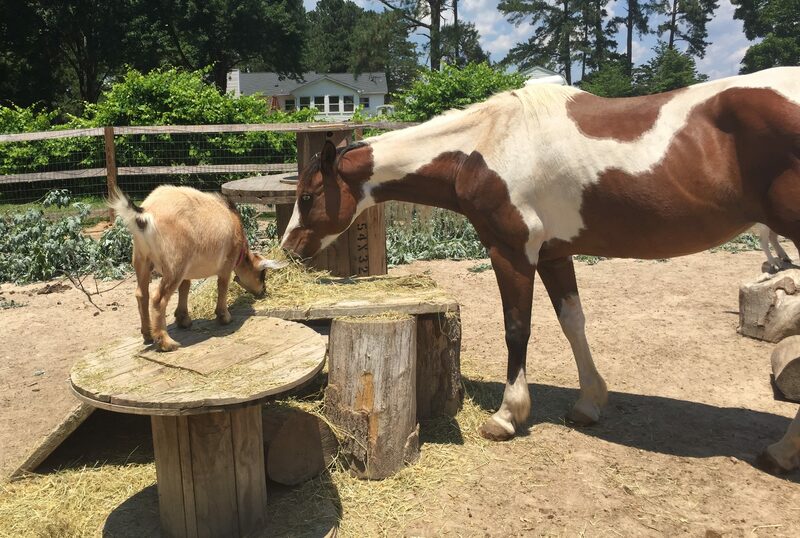 The goats will keep you captivated with their antics and the Donkeys will bray at your arrival. 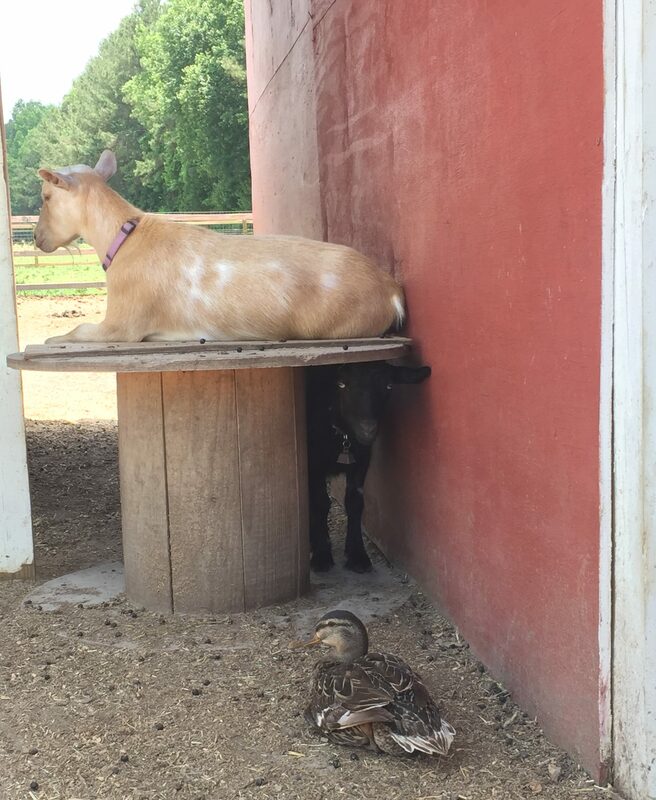 You can feed the chickens, ducks, or any of the four-leggeds with hooves or you can simply sit with them and be content to be in their presence. I stopped by the Asylum on June 11, 2017, to drop off a gift certificate for their upcoming fundraiser. Kirstin and Patrick Mulqueeny greeted me, then walked me to the barnyard to meet their animals. 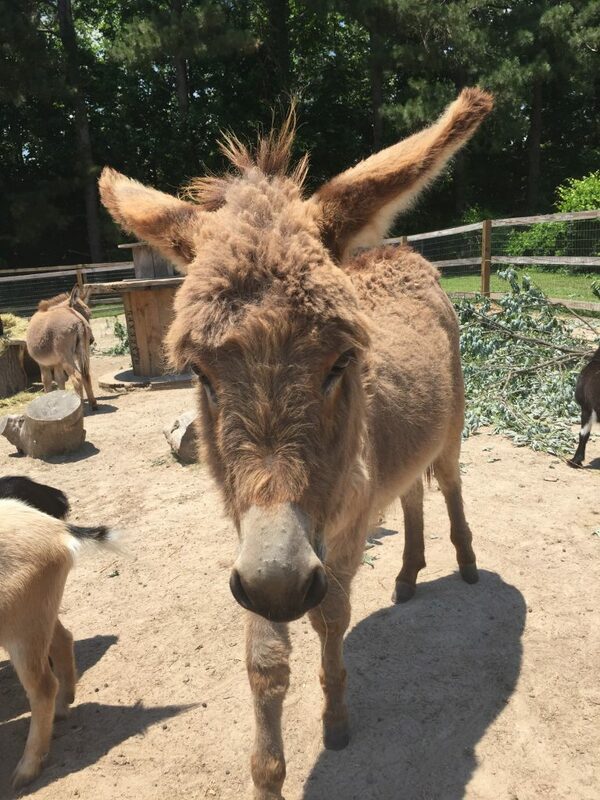 The first animal to approach me was Don Quixote, a small donkey with a friendly manner. An even smaller donkey, Sancho Panza, trailed behind. Kaya, a full sized paint horse, was eating hay nearby with tiny Gertrude — a mini horse — hiding off to the side. Kaya used to be owned by a local children’s troop. No longer needed, she ended up at the asylum. Little Gertrude found a home at the farm in January 2017, after being locked in a pasture with only hay and no human contact or care. 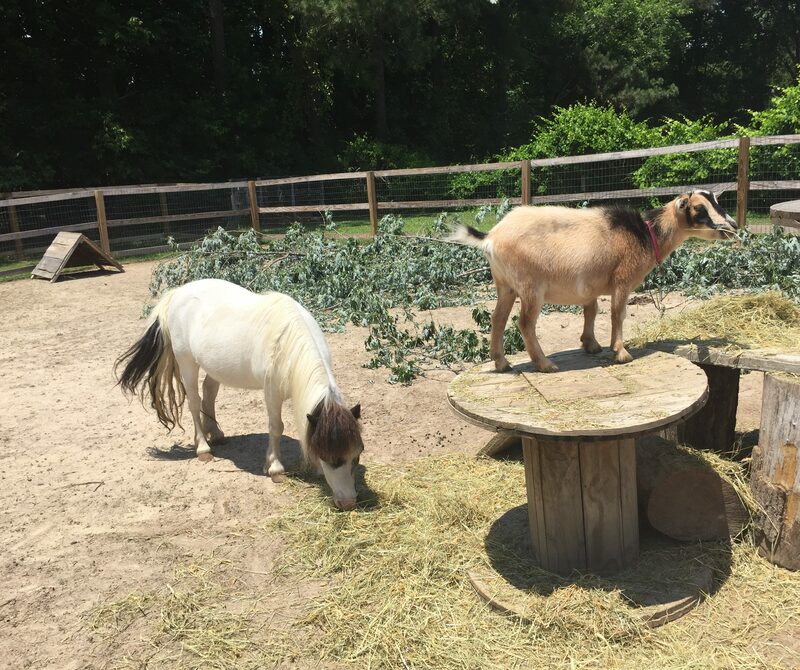 Now she is coaxed with carrots and after months of work has begun to trust Kirstin, her husband Patrick, and their helpers a little — just a little. Kirsten says it will take time for the mini horse to feel secure and comfortable with humans touching her. Ducks, some raised from ducklings, frolicked in a pool, while a pair of Mallard ducks — surrendered by the owner after one of them was attacked by a dog — peered at us from inside a shady shed. The asylum houses close to a dozen goats — happy jumpy leg-licking friendly goats. Kirstin’s husband broke out the carrots as treats. It was fun to hand out bits of carrot, pet the goats and equines, and just watch the ducks playing in water. 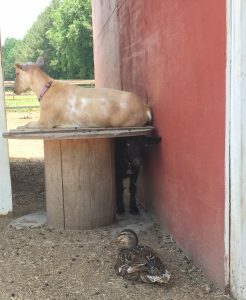 As the sun shone, goats tucked into and around the shading buildings in the pasture… it seemed like goats were around every corner. All the goats seemed happy to be petted and were comfortable around the humans there that day. One even pushed against my leg until I reached down and patted her on the head. Visit their online gallery to meet more of the animals that have found refuge there. Note: If you know of a goat or a sheep that needs love and care, contact The Black Sheep Asylum via email. 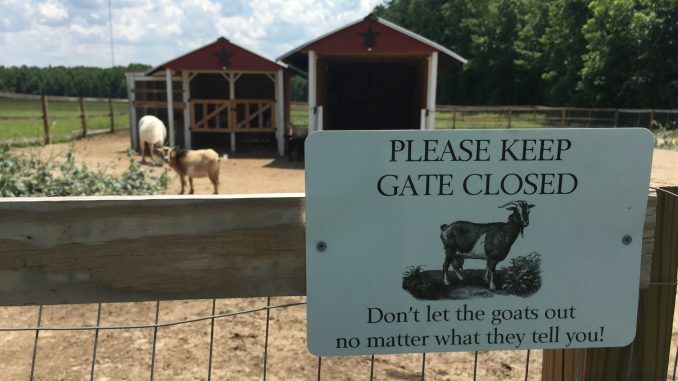 Opened in 2016, the nonprofit recently fenced a new pasture to give the goats some space of their own — though Big Kaya has been known to join them. The Black Sheep Asylum is hoping to expand their space to increase their ability to take in animals. In the meantime, their mixed herd and flock are waiting to welcome humans seeking a calm place to visit. To raise funds for the farm’s nonprofit work, a fundraiser is planned June 25, 2017, in Raleigh NC. 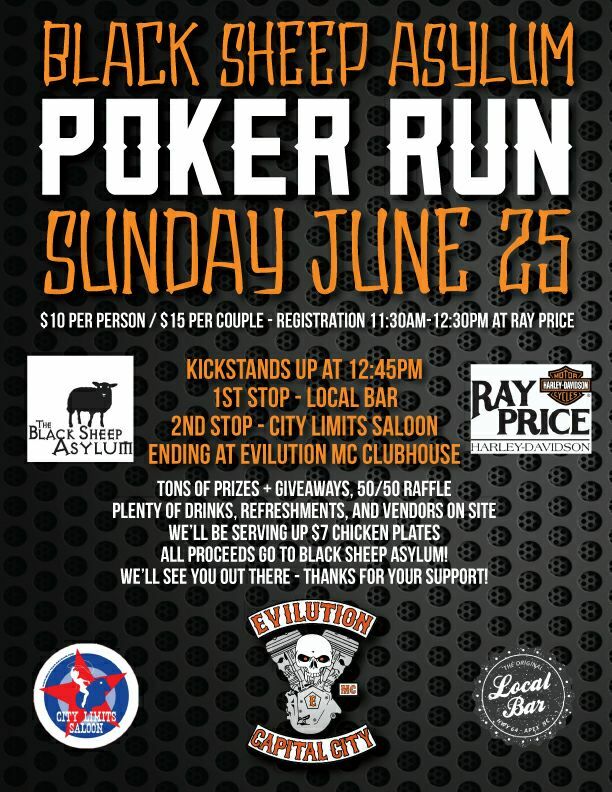 Motorcyclists/bikers will be participating in a Poker Run before joining everyone — all are welcome — at the City Limits Saloon, which is one of the Poker Run stops. A Poker Run is when bikers take a charity ride, stopping at destinations along the way to pick up a playing card. Once they have their hand of five, they meet and compare cards and see who has the best Poker hand. Businesses from Middlesex to Raleigh have donated a variety of gift certificates and prizes for the fundraiser. Two companies even donated adult beverages to use as a part of the fundraiser, with proceeds going to the nonprofit. Join the fun June 25, contact the asylum to find out more about animal therapy, or call to find out how to help. The Black Sheep Asylum is online at www.theblacksheepasylum.com, and on Facebook here. Poster for The Black Sheep Asylum fundraiser 2017.